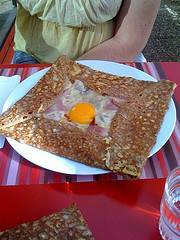 The Breton galette is a large buckwheat crepe that is stuffed with various savory fillings. Here are a few tips for successful galette making. Question: Do you have a recipe for Galette? We recently returned from a trip to France and while in Bretagne we had galettes which were excellent and although they are like crepes according to the locals they are made differently, a more savory version. Answer: Bonjour, thanks for writing with your question. The breton galette is a special sort of crepe that is made with buckwheat flour and usually served with various savory fillings. Buckwheat is called sarassin or blé noir (black wheat) in French, which is funny because it is not wheat at all. Indeed it more closely resembles the rhubarb plant. A traditional recipe for galettes calls for three ingredients only: buckwheat flour, salt and water. Here in France you can buy packaged crepes made with just these three ingredients. They are large (maybe 18 inches in diameter), quite thin, and have a lacy, even holey, appearance. It is difficult to get the same effect at home. Buckwheat tends to be very sticky to work with and you would need an especially large skillet (the crepe makers of Bretagne use what they call a bilig). that come with a little wooden rake that allows you to spread the batter the batter thinly and this could help with the results. Most home cooks though can get decent, if not truly authentic results with a smaller crepe pan and this buckwheat crepes recipe. You'll have to swirl the pan to spread the batter and results are bound to be thicker (and smaller) then what you experienced on your visit to France. Use a recipe, like the one linked to above, that includes some wheat flour. This helps cut down on the stickiness problem you get with buckwheat. Eggs also make a batter that is easier to work with. 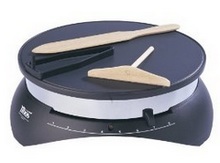 Crepe batter will differ from day to day. It depends on such factors as the sort of flour used and the humidity in the air. You may want to add more liquid to a recipe to get it to a consistency that works well for you. Let the batter sit for at least two hours in the refrigerator. This is recommended with most crepe recipes. It gives the flour and liquid time to get to know each other and mingle more intimately. It's easier to make a batch ahead of time and then reheat them with the filling. If you have a crowd standing around waiting for their crepe it can be exasperating, especially if it's your first time. If at all possible, cook your crepes over a gas flame. For some reason an electric burner just doesn't give the same results. Use a hot, well greased, non-stick pan. Really the hotter the better. You just have to be careful not to burn them. This helps with sticking problems as does using plenty of butter to grease the pan. Let the first galette go - it's probably going to stick and tear and it's real purpose anyway is to get the pan ready for the rest of the bunch. Here in France they say: La première, c’est pour le chien! Hope that helps and that you are soon enjoying a homemade Breton galette.